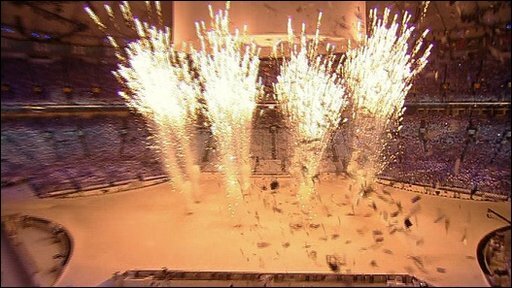 The 2010 Winter Olympics opened in spectacular fashion on Saturday but the ceremony was overshadowed by the death of Georgian luger Nodar Kumaritashvili. The Georgian team, wearing black armbands, were given a standing ovation at the ceremony and a minute's silence was impeccably observed in Vancouver. The stunning visual ceremony started with a snowboarder jumping through the Olympic rings. And, despite the tragedy, there was a festive mood inside BC Place Stadium. The ceremony was held undercover for the first time and officially opened by Canada's Governor General Michaelle Jean. The Olympic flame was jointly lit by four Canadian sports heroes - all-time hockey great Wayne Gretzky, skier Nancy Greene, speed skater Catriona Le May Doan and basketball All-Star Steve Nash after being carried into the arena by paralympian Rick Hansen. However a technical hitch meant only three of the torchbearers were able to light the flame after one of the ice columns failed to appear. Gretzky then made his way to the harbour to light a second cauldron outside in the harbour area which will burn for the 17 days of competition. IOC president Jacques Rogge, wearing a black tie, prefaced the traditional opening speeches by saying: "It is with great sadness that we acknowledge the tragic loss of Nodar Kumaritashvili of the Georgian team, who passed away this morning in a training accident on the luge track. "We extend our deepest sympathies to his family, friends, team-mates and country." And John Furlong, chief executive of Vanoc, the organising committee, said: "May you carry his [Kumaritashvili's], Olympic dream on your shoulders and compete with his spirit in your hearts." More than 60,000 spectators witnessed 2,500 athletes from 82 nations parade - including debutants Cayman Islands, Colombia, Ghana, Pakistan and Peru. 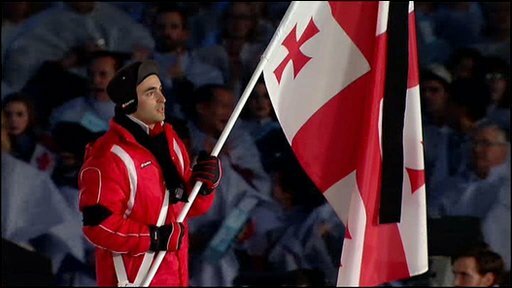 "Just as the cauldron now burns bright in downtown Vancouver, so all of us at the Games keep a candle burning for Nodar Kumaritashvili"
The largest cheer was for the host team Canada, with Clara Hughes, defending 5000m speed skating champion waving the flag and clad all in red. 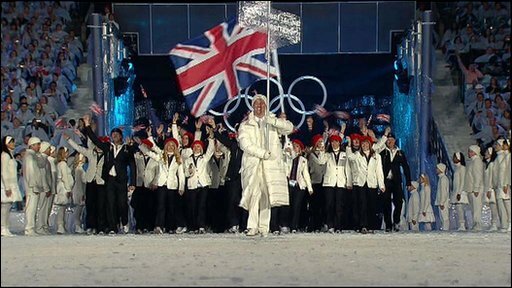 Great Britain were led in by skeleton slider Shelley Rudman resplendent in a white jacket and navy blue trousers and a red beret. She was the team's only medallist at the 2006 Winter Olympics but at the Vancouver Games the British are being tipped for possibly their best medal haul, if they can beat the four medals won in 1924. The three- hour extravaganza included a cultural segment featuring many of Canada's best-known musical stars - Bryan Adams, Nelly Furtado and KD Lang. Canada's aboriginal communities were also highlighted with the four chiefs of the First Nations, whose traditional native territory overlaps the Olympic region, part of the official delegation at the ceremony. Among the state-of-the-art special effects included a giant, sparkling polar bear rising from the stadium floor and hovering over performers on a simulated ice floe.